Maddie knows well the perils of amateur sleuthing and is reluctant to get involved. But her mother insists she investigate. Does her mom have a secret agenda? Or is she somehow connected to the murder? Maddie’s back and this time she’s been accused of stealing a haunted grape press. As if that weren’t bad enough, the man who accused her of stealing the press is found dead, and Maddie is the prime suspect. Sure that officer Laurel Hammer has no interest in finding any other suspects, Maddie takes it upon herself to investigate. Full of twists, entertaining characters, romance, and a bit of family drama, the second book in the Perfectly Proper Paranormal Museum series doesn’t disappoint. 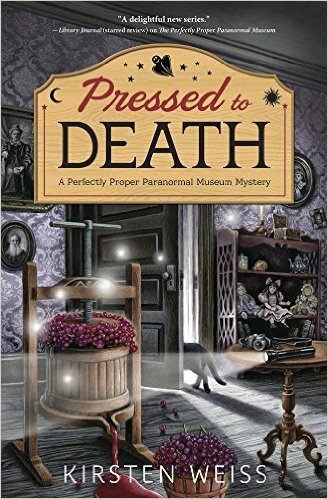 Enter the Rafflecopter giveaway (ENDED) for your chance to win one of 2 print copies of Pressed to Death! Kirsten has never met a dessert she didn’t like, and her guilty pleasures are watching ghost Whisperer re-runs and drinking good wine. Thanks for the review. It actually sounds good. Have to check it out. This is a new series to me. It sounds like my kind of read. I like the paranormal museum aspect and that it takes place in wine country. 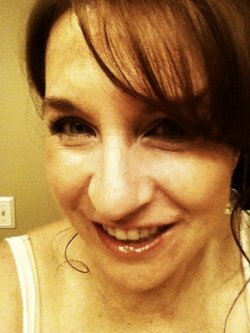 I like the paranormal aspect mixed with a cozy – it’s a LOT of fun! It’s a fun series, and quick to read. I hope you’ll enjoy it! I am enjoying this series. Author is very good. It is a fun series – thanks for coming by Pearl!